We at Cigarette Burns Towers have a fantastic month in store for you, 2 films that in many ways couldn’t be further apart, yet can equally snuggle up together and keep each other warm on a cold winter night. Monday, 6th September sees us charging into the American Mid West where a plague of giant killer… um… bunnies? Bunnies… yup that what it says… Giant Killer Bunnies… Like cute fluffy ones? Just normal bunnies? Only bigger? So giant killer cute bunnies? 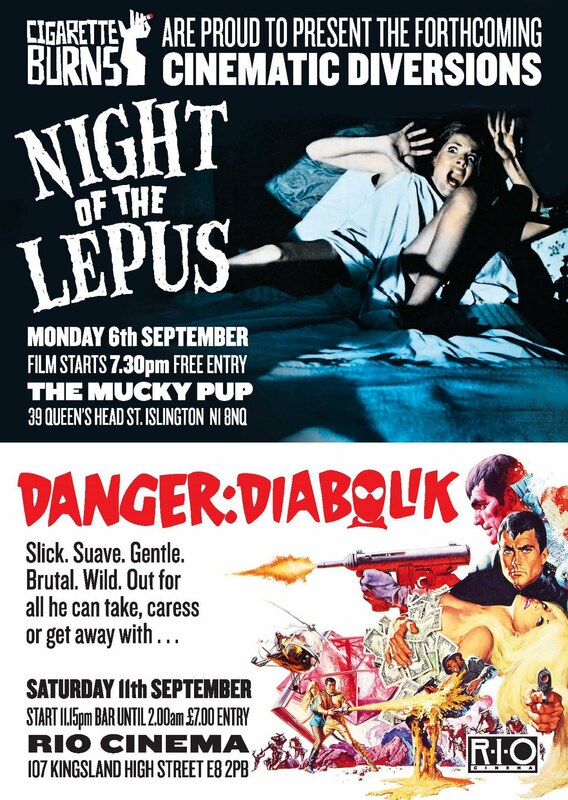 A Plague of giant killer bunnies is ravaging the countryside and only Janet Leigh and Bones of Star Trek (the original, not the JJ Abrams one) can save the planet from the potential dangers of Giant Killer MUTANT Bunnies in 70s eco warning Night of the Lepus! Saturday, 11th September, we will be showing the classic Euro Spy, super hip swinging 60s kaleidoscope of fun and uber hip, Danger: Diabolik. From the producers of Barbarella and directed by the Legendary master Mario Bava, during his brief excursion away from the horror genre, Danger: Diabolik is non stop visual feast. The outstanding soundtrack is provided by none other than the maestro himself, Ennio Morricone, which will you will be scouring the internets for a copy of the OST for the next few weeks, I promise. As Cigarette Burns Cinema is more often than not located in a pub and we are now venturing into a proper cinema, we were worried about how we could make this a bit more special than a regular night at the movies. To this end, we will have a DJ and be serving drinks until 2am, so get your tickets from here in advance, a measly £7, and more than worth it. For those of you who might be unfamiliar with Dalston and the Rio Cinema, both are very easy to get too and from, there’s the London Overground for you train types and buses, from London Bridge or Liverpool St theres the 149 and the 242, Holborn/Waterloo the 243 or the 76. Hope to see you for a night to be remembered! This entry was posted in achtung, Coming Soon, In Theatres. Bookmark the permalink.